During our recent annual meeting and awards breakfast, we honored our Top Producers for 2017. These individuals are outstanding members of our team who have demonstrated leadership and empowered homebuyers and sellers to achieve successful outcomes. 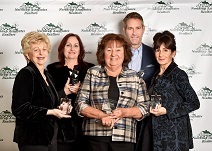 Pictured (from left to right) are: Marcia Poretsky, Maureen Rossi-DiMella, Helen Bolino, Eric Doherty and Debra Roberts. Taking top honors was Helen Bolino. Helen has been the number one agent in Lynnfield for sales and listings for 18 consecutive years. This award represents Helen’s investment of many hours of personal service and attention to her customers and clients. Maureen Rossi-DiMella was once again recognized as a top producer after a very successful year. Maureen continues to create lasting relationships with all of her clients by ensuring that each transaction is handled in a personalized and professional manner. Throughout her career, Marcia Poretsky has consistently been one of the region’s top producers, specializing in single-family and condominium sales, she has built a loyal clientele as a result of her attention to detail and problem solving skills. This is a well-deserved recognition of all of her hard work. Eric Doherty achieved Top Producer status for a second consecutive year. He is a rising star in the real estate community. His goals are to make each transaction as seamless as possible. Being honest, diligent and accessible are guidelines that he strives for with each and every client. Debra Cuozzo Roberts prides herself on a high level of honesty, accessibility, and personal service. She is successful because she is a proactive thinker, a problem solver and a reliable communicator. Those attributes make her a super effective representative for her clients. As a locally owned and independently run office, Northrup Associates strives to provide the highest level of service. That has been the secret to our success in the past and will remain our guiding principle in the future. Congratulations again to our top producers! We couldn’t do it without you!